The best chocolate cake delivery. 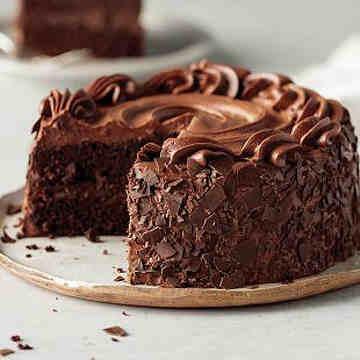 Our rich and seductive Chocolate Lover's Cake draws rave reviews from even the most seasoned chocoholics! A red rose adorns the top of the cake and chocolate shavings decorate the sides. Moist, indulgent and full of flavor, for an unforgettable finale to your most elegant meals. Ingredients: Cake Base (Bleached and Enriched Wheat Flour (Niacin, Reduced Iron, Thiamine Mononitrate, Riboflavin), Sugar, Partially Hydrogenated Soya Oil, Palm Oil, Mono and Diglycerides, Propylene Glycol Mono Esters, Modified Food Starch, Dextrose, Whey Solids, Leavening Sodium Aluminum Phosphate, Sodium Bicarbonate, Salt, Vital Wheat Gluten, Sodium Stearoyl Lactylate, Artificial Flavor), Eggs, Soybean Oil, Water, Buttermilk, Sugar, Cocoa Powder, Dark Cocoa Powder, Sodium Bicarbonate, Chocolate Frosting (Chocolate Chips (Sugar, Chocolate Liquor, Cocoa Butter, Soy Lecithin added as an emulsifier, Vanilla, Artificial Flavor), Powdered Sugar, Margarine (Partially Hydrogenated Soybean Oil, Water, Partially Hydrogenated Cottonseed Oil, Salt, Mono and Diglycerides, Colored with Annatto/Turmeric, Calcium Disodium EDTA added as a preservative, Artificial Flavor, Vitamin A Palmitate added), Vanilla, Agar), Contains: Wheat, Soy, Milk and Eggs. Manufactured on equipment that also processes milk, peanuts and tree nuts.